Mohammad Ali Nazari is a PhD student in the Communication Systems research group, and part of Wallenberg Autonomous Systems Program (WASP). He has received his M.Sc. 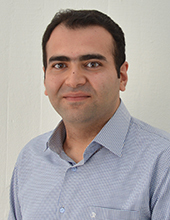 in Communication Systems from Sharif University of Technology, Tehran, Iran.In his PhD project, he mainly focuses on the communication and positioning strategies, tailored to the control requirements of automated transport. The project concerns optimization of the overall transport performance by taking advantage of new possibilities for efficient communication and accurate position estimation.His research interests include vehicular communications, machine-to-machine communications, and multi-disciplinary topics in 5G wireless communications and networking. There might be more projects where Mohammad Ali Nazari participates, but you have to be logged in as a Chalmers employee to see them.